Let me wish all my readers a spectacularly positive 2015. I am looking forward to a great year. You may recall from previous blogs and Facebook posts that I used the potential of embarrassing myself as motivation to obtain two of my 2014 goals. I wanted to lose and keep off twelve pounds, and I wanted to maintain a certain level of exercise through the year. 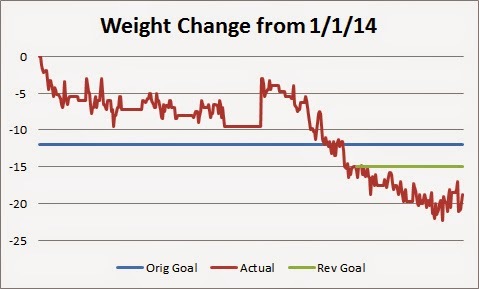 The chart demonstrates that when I put my mind to it, I can lose weight, although I struggled while we were on the road. By the end of September, I wanted to maintain the fifteen pounds I had lost and so set that as a revised goal for the remainder of the year. I had set an objective of earning at least 250 “Cooper Aerobic Points” each month. That I did not do. I found it easy to blow off exercise while we were on the road in May, June and July. The good news is that while not consistent, I did average 255 monthly points during the year. Because I inherited my love of data-retention from my father, I can show 2014 as part of a longer perspective. The picture below suggests my 2015 weight goal. This chart (looking a lot like the Himalayans) shows the up-down cycle of my weight since the middle of 1989. Long flat stretches on the graph do not mean I enjoyed amazingly stable weight during the period; they indicate I was not weighing myself. For the entire period, my average weight was 191.4 (red line). The green line shows a running ten-year average weight, currently sitting at 194.2. For 2014 I averaged 186.8. All of which is to say that my biggest problem with weight is not the ability to lose it, but once lost to keep it off. My objective for 2015 is to avoid a weight gain. I have not averaged less than 180 pounds for a calendar year since 1994. I have set as the 2015 weight goal to average at most 179 pounds. Would I like to average less than that? Absolutely. The main task, however, is to avoid the bungee cord rise that has followed previous weight losses. My exercise statistics since I retired do not exactly look robust. 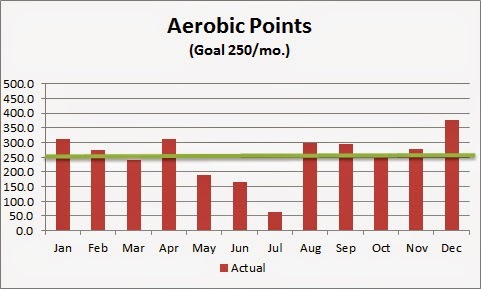 If I continue my goal of 250 aerobic points a month, I will be well ahead of the average year. 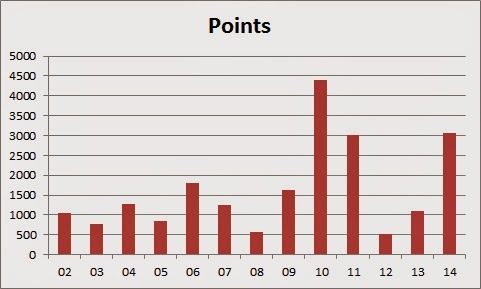 Before I went back to the data and put this chart together, I planned to increase the goal to 300 points a month. Looking at my history, I’ll be fine at the 250 level and much less likely to injure myself. I will post results periodically during 2015. If things are going well, I’ll bore you quarterly. If they aren’t going well, I’ll fess up monthly. Good luck with your 2015 goals Jim! It's all about accountability, isn't it? I have a Fitbit, which I love because it really drives home the days you're not moving (i.e. stuck in front of a computer for hours on end) and it has all sorts of analytics built in, plus apps to count food eaten etc. I have a "lose 10 pounds" goal for this year myself! Best of luck with your 2015 goal. Fitbit is such an interesting idea. My problem would be that I'd spend hours of time analyzing the data. :) But as you say, the accountability of an independent measuring device reminds you of exactly where you are on your goals. Yes. Fitbit recommends 10,000 steps a day. I'm a runner, but I don't run every day. The days I run, I easily get my 10,000 steps in (my best was 45,000 steps in a day when I ran the 30k Around the Bay in 2014). But on the days where I don't run and do a yoga class, for example, I was shocked to see my steps would be something in the range of 2,500. So it really makes you think. Your determination is intimidating. I am, and shall remain, a complete sloth except for walking the dog.